milestones of the five year plan | doberman pizza. Those “milestones”, though—what are those? In the interest of cutting through some of the jargon, here’s my attempt at a brief explanation/recap of “milestones” in the context of the Five Year Plan. The “milestones” mentioned by the Universal House of Justice in its recent guidance all relate to the development of a community’s capacity for systematic, collective action towards its own spiritual and social transformation. Basically, we can think of them as stage markers that help describe how advanced a community in its spiritual and social development. Here are the ones we know about. No systematic action yet, although individual initiatives may take place here and there. Institute process may not yet be established or is at the very beginning stages. An initial flow of human resources goes through the sequence of institute courses and advances into the field of systematic action. Core activities “are being maintained by those progressing through the sequence of institute courses and committed to the vision of individual and collective transformation they foster.” A program of growth first emerges. See: 28 December 2010 message to the Conference of the Continental Boards of Counsellors , para. 4; Insights from the Frontiers of Learning, Section 2, “Emerging Programmes of Growth”; both available as part of the compilation The Five Year Plan, 2011-2016 . A steady stream of friends is going through the institute process & engaging in intensive, systematic action; the process of growth becomes self-sustaining; “all the elements necessary to accelerate the expansion and consolidation of the Faith are not only in place but also functioning with an adequate degree of effectiveness”; an intensive program of growth develops. See: 28 December 2010 message to the Conference of the Continental Boards of Counsellors , para. 9; Insights from the Frontiers of Learning, Section 3, “Increasing Intensity”; both available as part of the compilation The Five Year Plan, 2011-2016 . Capacity for self-sustaining social action within a population, based on the skills of service developed through the institute process, emerges. A system for extending a “dynamic pattern of community life” that can “engage a people…in the work of their own spiritual and social transformation” is evident. See: 29 December 2015 message to the Conference of the Continental Boards of Counsellors , para. 31. See: 29 December 2015 message to the Conference of the Continental Boards of Counsellors , para. 32. So now, a question: How advanced do you feel your home cluster is, in terms of these milestones? 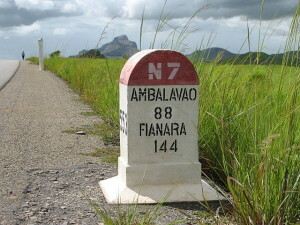 Photo: Borne routière sur la Route Nationale 7 à Madagascar, by Bernard Gagnon. This entry was posted in baha'i blog and tagged civilization-building, collaboration, guidance, intensity by danger. Bookmark the permalink. In our little community we are starting small. We have a good number of kids among the Baha’i community, so we decided to have a children’s class every week. Sometimes the parents pray and consult in the other room while the classes are happening. The hope is that friends from the outside community will come and bring their kids, and that the adults can eventually have a proper devotional. But right now we are just trying to get he thing started and established. I think it’s good to understand the broader vision, which I agree that the House of Justice’s recent letter lays out well. But I also feel we need to be realistic in our immediate goals, so as not to put undue pressure on ourselves and our communities, and keep our local efforts enjoyable and sustainable. In other words, go for “small” with gusto and enthusiasm, see how it works out, and then go from there. That sounds like an amazing way to get things started. It makes perfect sense to start small, that is, start with a manageable plan that members of the community can work together on, and that will help them generate learning. The key at this stage, I think, is fostering and maintaining unity and solidarity amongst the members of the community in supporting these initiatives. The more united we are, the more easily we can ride out the inevitable crises and learn from them. And of course, it helps immensely to do all of this with gusto and enthusiasm, as you said. As you said, we have to understand the broader vision while also setting realistic goals for ourselves. This, of course, requires that we have an honest and accurate understanding of our own capacity as a community—that we read our own reality, to borrow the phrase from the Universal House of Justice. Once we know our capacity, we can better understand what steps are needed to bring us forward along the path of growth. Then we act on these steps, come back and reflect on our experience, and then consult on the next steps—and the next cycle of growth continues. To my mind, an excellent overview of the process so wonderfully described in that document from the Universal House of Justice. Thank you for presenting this. Both the Báb and Bahá’u’lláh have made explicit and implicit statements in their Writings regarding the further reaches of time, well beyond the current Plans. My favourite comes from the Báb. I offer it here (below) that it may be known that, regardless at any time how bleak the outlook may appear, at how insurmountable just sometimes the task may appear to us, if we but place our full trust in God and carry out His wishes, as we see them expressed in terms of the action needed in this day, as guided by the Universal House of Justice, then we are utterly assured that our efforts must and will bear fruit. Be patient. Be trusting. Be assured.